The 2001-02 season was the club’s historic first campaign in the Football League. The club started the season in fine style, recording their first win in the Football League with a 1-0 victory over York City. Warren Patmore, signed from Yeovil and scored the club’s first ever Football League goal but lasted only four games before transferring to Woking. 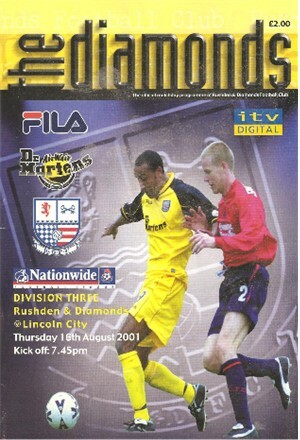 The first game at Nene Park was against Lincoln City, with the game ending 0-0 in front of the ITV Digital cameras. Despite a Worthington Cup win over Burnley, the club went seven league matches without a win and the hard-earned league status looked under threat as Barry Hunter was signed along with Scott Partridge and the returning Ritchie Hanlon to try to reverse the trend. The record books were rewritten for Diamonds on October 2001 but unfortunately it was for the wrong reasons. A 7-1 hammering at Cardiff in the LDV Vans Trophy game was a club record heaviest defeat at the time. However, the season was about to change in December following the signing of Onandi Lowe, a Jamaican international who had an excellent scoring record for his country. This signing was reinforced with the arrival of Stuart Wardley and Paul Hall. The club lost only eight games in 26 matches from December. Lowe went on a scoring spree for Diamonds – hitting nine in the final five games of the season to shoot Diamonds up the table and secure a play-off spot. Diamonds faced Rochdale in the semi-final and after a hard-fought 2-2 draw at Nene Park it was all down to one match at Spotland on a cold Tuesday night for a place in the final at the Millennium Stadium. It looked as though Diamonds would not get their day at Cardiff after a mistake from Billy Turley, miskicking a rolling ball from Mark Peters, saw the club go one goal down. However, their day in the Welsh capital was secured when Onandi Lowe and Paul Hall grabbed a goal apiece. The final, however, was not to be Diamonds day and Cheltenham ran out deserved 3-1 winners, with Hall grabbing the club’s goal at the famous stadium.